Natural Kraft Paper Liquor Bags, 4-1/4" x 2" x 12"
Dimensions: 4-1/4" x 2" x 12"
Natural Kraft Paper Liquor Bags, 5" x 3" x 15"
Dimensions: 5" x 3" x 15"
Paper Liquor Bags are natural Kraft paper bags that feature a serrated top along with a 3 inch gusset which enhances the space available within the paper liquor bag itself, to accommodate wine and liquor bottles. Our Paper Liquor Bags are custom made to hold a variety of liquor bottles while also providing ample and reliable support. Each paper liquor bag is biodegradable, providing an environmentally conscious alternative to other paper bags. Customizing options are also available for both quart and pint size Liquor Bags upon request. 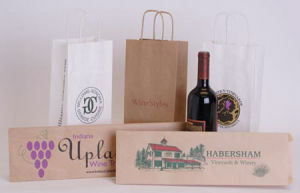 We offer Liquor bags in two sizes, Quart & Pint.Natural Kraft Paper Liquor Bags come with 1,000 per case. For customizing Paper Liquor Bags, or to speak to a Product Expert, please contact American Retail Supply at 1-800-426-5708.